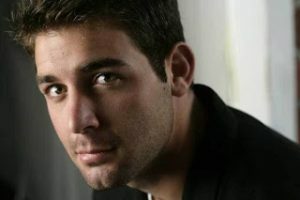 James Wolk is an American film and television actor. He is best known for roles such as Jackson Oz in the drama series Zoo, Charlie in the 2012 comedy film For a Good Time, Call…, and Zach Cropper in the CBS sitcom The Crazy Ones. Wolk played Robert “Bob” Allen in the Fox television series Lone Star (2010) and had a recurring role in the AMC drama series Mad Men (2013–2014). He also starred in the films This Is Happening (2015), and Mercy (2016). Born on March 22, 1985 in Farmington Hills, Michigan, USA, to Edie and Robert Wolk, he was raised in Reform Judaism. He has one older sister named Katie Ray. After graduating from North Farmington High School in 2003, he attended the University of Michigan School of Music, Theatre & Dance and graduated in 2007. He started his acting career appearing on the CBS soap opera As the World Turns. He has been married to Elizabeth Jae Byrd since June 20, 2015. They have a son together. *He was born on March 22, 1985 in Farmington Hills, Michigan, USA. *He was born into a Jewish family. *He is a 2003 graduate of North Farmington High School. *As a teenager, he worked as an emcee at Bar and Bat Mitzvahs. *He is a supporter of Camp Twitch and Shout. *He is a fan of old Robert De Niro movies. *He is on the Board of Directors of the Brad Cohen Tourette Foundation. *1985’s film “Back to the Future” is his favorite film. *Michael J. Fox and Tom Hanks are his favorite actors. *He has a dog, Flea.